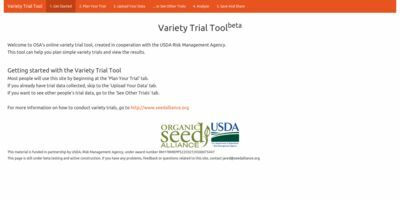 Welcome to OSA's online variety trial tool, created in cooperation with the USDA Risk Management Agency. This tool can help you plan simple variety trials and view the results. Most people will use this site by beginning at the 'Plan Your Trial' tab. If you already have trial data collected, skip to the 'Upload Your Data' tab. If you want to see other people's trial data, go to the 'See Other Trials' tab.